Projection lens having improved properties such as a high throughput are described. In one embodiment, a projection lens is described comprising in sequential order from a screen side a first lens group, a second lens group of positive refractive power, and a third lens group of positive refractive power. At least one lens group has an aspheric surface. The ratio of the focal length of the projection lens (F) to the focal length of each of the lens groups (F1,F2, and F3) is such that | F1/F | > 5, 0.5 2/F | 3/F < 8. In another embodiment, a projection lens is described comprising in sequential order from a screen side a first lens group, a second lens group of positive refractive power, and a third lens group of positive refractive power. At least one lens group has an aspheric surface. ; The ratio of the focal length of the projection lens (F) to the focal length of each of the lens groups (F1, F2, and F3) is such that | F1/F | > 5, 0.5 2/F | 3/F < 8. 尽管已描述出多种投影透镜，但行内仍认为将会受益于具有改善特性(如，高通过量）的(如紧凑型）投影透镜。  While a variety of projection lens have been described, but still within the line that would benefit (such as a compact) of the projection lens with improved properties (e.g., high throughput) is. 在一个实施例中，描述了下述投影透镜，其包括从屏幕侧依次排列的第一透镜组、具有正屈光力的第二透镜组、和具有正屈光力的第三透镜组。  In one embodiment, the following describes a projection lens, a first lens group comprising in order from the screen side, having positive refractive power of the second lens group and the third lens group having positive refractive power. 至少一个透镜组具有非球面表面。 At least one lens group has an aspherical surface. 投影透镜的焦距（F)相对透镜组中的每一个的焦距（F1、F2、和F3)的比率使得IF1/F|>5、0.5< IF2/FI <0.9、并且1〈F3/F〈8。 Each of the focal length (F1, F2, and F3) of the lens group relative to the projection lens focal length (F) such that the ratio IF1 / F |> 5,0.5 <IF2 / FI <0.9, and 1 <F3 / F <8 . 在另一个实施例中，描述了下述投影透镜，其包括从屏幕侧依次排列的第一透镜组、具有正屈光力的第二透镜组、和具有正屈光力的第三透镜组。  In another embodiment, the following describes a projection lens comprising a first lens group arranged in order from the screen side, having positive refractive power of the second lens group and the third lens group having positive refractive power. 至少一个透镜组具有非球面表面。 At least one lens group has an aspherical surface. 投影透镜的焦距（F)相对透镜组中的每一个的焦距（FpF2、和F3)的比率使得IF1/F|>5、0.5<|F2/F|<2.0、并且1.4〈F3/F〈8。 Each focal length (FpF2, and F3) opposite the lens group of the projection lens focal length (F) is such that the ratio IF1 / F |> 5,0.5 <| F2 / F | <2.0, and 1.4 <F3 / F <8 . 在其他实施例中，描述了下述光学引擎，其包括照明系统、成像系统；和本文所述的投影透镜。  In other embodiments, it is described that an optical engine including an illumination system, an imaging system; and a projection lens as described herein. 描述了包括这种光学引擎的前投影和背投影显示装置。 It describes a device comprising such an optical engine of a front projection and rear projection display. 这些图未按比例绘制，并且仅用于示例性目的。  These figures are not to scale and are only for illustrative purposes. 本发明描述了适用于投影显示系统的投影透镜。  The present invention describes a projection lens system suitable for projection display. 图1示出了示例性光学引擎61的示意图，该引擎具有下述部件中的一个或多个:照明系统62或62'、成像系统64、聚焦机构65、和投影光学器件66。  FIG. 1 shows a schematic of an exemplary optical engine 61, the engine having one or more of the following components: illumination system 62 or 62 ', imaging system 64, a focus mechanism 65, and the projection optics 66. 尽管示出了两个不同的照明系统62和62'，但通常仅使用一个照明系统。 Although a two different illumination systems 62 and 62 ', but usually only one lighting system. 当照明系统位于由附图标记62标示的位置时，使用的成像器为反射型成像器。 When the illumination system is indicated by reference numeral 62 is located in position, the imager used is a reflective imager. 相比之下，当照明系统位于由附图标记62'标示的位置时，使用的成像器为透射型成像器。 In contrast, when the illumination system is located at the position indicated by reference numeral 62 'indicated, the imager used is a transmissive imager. 光学引擎可在投影屏幕68或观看表面上生成图像。 The optical engine 68 may be a projection screen or viewing an image generated on the surface. 由于观看者和光学引擎位于投影屏幕的同一侧，则图1示出了采用光学引擎61的前投影显示系统。 Because the viewer and the optical engine are on the same side of the projection screen, Figure 1 shows the optical engine 61 employing a front projection display system. 图3A和3B示出了采用光学引擎110的背投影显示系统。 Figures 3A and 3B show a rear projection optical engine 110 using the display system. 下面对光学引擎中的各个元件进行详细的讨论。 Next, the optical engine is discussed in detail various elements. (ii)可得自德国慕尼黑（Munich, Germany)的欧司朗有限股份公司（OSRAM GmBH)的OSRAMP-VIP250灯组件。 (Ii) is available from Munich, Germany (Munich, Germany) OSRAM company limited by shares (OSRAM GmBH) of OSRAMP-VIP250 lamp assembly. 其他适用的灯和灯组件结构也可用于本发明。 Other suitable lamps and lamp assembly structure of the present invention may also be used. 例如，可使用金属卤化物灯、或卤钨灯、或发光二极管（LED)。 For example, using a metal halide lamp, or a tungsten halogen, or a light emitting diode (LED). 可用于本发明实施例的滤光器、色轮和积分器的类型并不是关键的。 Can be used for the filter embodiment of the present invention, the type of the color wheel and the integrator is not critical. 在一个示例性实施例中，色分离装置为成像器光源中的旋转型红/绿/蓝(RGB)色序盘。 In one exemplary embodiment, the color separation means is a light source in the imager rotary type red / green / blue (RGB) color sequential disc. 示例性的市售色轮为得自列支敦士登巴尔查斯（Balzers, Liechtenstein)的优利讯巴尔查斯有限公司（UNAXIS Balzers, LTD)的UNAXIS RGBW色轮。 Exemplary commercially available color wheel is available from Balzers Liechtenstein (Balzers, Liechtenstein) of Unaxis Balzers Ltd. (UNAXIS Balzers, LTD) of UNAXIS RGBW color wheel. 液晶RGB色序快门同样可以用于本发明的实施例。 The liquid crystal RGB color sequential shutter can also be used in embodiments of the present invention. 示例性的市售积分器为可得自优利讯巴尔查斯有限公司（UNAXIS Balzers LTD.)的空心管型积分器。 Exemplary commercially available integrator is available from Unaxis Balzers Ltd. (UNAXIS Balzers LTD.) A hollow tube type integrator. 成像系统64包括成像器并且通常还包括电子器件。  The imaging system 64 includes an imager and typically further comprises an electronic device. 可用于本发明的有用的反射型成像器为可得自德克萨斯州达拉斯（Dallas，Texas)的德州仪器公司（TexasInstruments)的具有约22mm对角线尺寸的XGA数字微镜器件（DMD)。 May be useful for reflective imaging of the present invention is available from Dallas, Texas (Dallas, Texas) Texas Instruments (TexasInstruments), XGA digital micromirror device (DMD) having a diagonal dimension of about 22mm . 作为另外一种选择，可将透射型或反射型液晶显示器用作成像器。 Alternatively, a transmission type or reflection type liquid crystal display device can be used as the imager. 在光学引擎中，成像器的表面被布置为基本上平行于投影屏幕的表面。 In the optical engine, the surface of the imager is disposed substantially parallel to the surface of the projection screen. 对一些具体实施，聚焦机构65可通过将一个或多个下述透镜装配在可滑动的或有螺纹的底座(未示出）上实现，所述底座可以通过手动或通过使用电子驱动机构来调节。  For some specific embodiments, the focusing mechanism 65 may be formed by one or more of a lens fitted in a slidable or threaded mount (not shown) implemented on the base either manually or by using an electronic driver institutions to adjust. 例如，聚焦可以通过使用变焦或缩放透镜来实现。 For example, focusing can be achieved by using the zoom lens or zoom. 作为另外一种选择，对于具有设定在光学引擎61和显示屏68之间的预定固定位置的投影组件而言或者对于背投影应用而言，不需要用户聚焦。 Alternatively, a setting for a projection assembly between the optical engine 61 and the display 68 of a predetermined fixed position or for rear projection applications, no user focus. 在一些具体实施中，屏幕68可包括多层材料，例如，被构造为如美国专利N0.6，179，426中所述的多个菲涅耳元件。  In some embodiments, the screen 68 may include multiple layers of material, for example, is configured as described in U.S. Patent No. N0.6,179,426 plurality of Fresnel elements. 屏幕可被设计为控制光强分布沿水平方向播散，以适应水平就位在屏幕前面的观看者。 Screen may be designed to control the light intensity distribution of the spread in the horizontal direction to accommodate viewers horizontal position in front of the screen. 屏幕的替代实施例可包括多层膜工艺、双倍增亮膜(DBEF)工艺、或VIKUITI™工艺，这些工艺均得自明尼苏达州圣保罗（Saint Paul, Minn)的3M公司。 Alternative embodiments may include a screen multi-layer film technology, Dual Brightness Enhancement Film (the DBEF) technology, or VIKUITI ™ process, such processes are available from St. Paul, Minnesota (Saint Paul, Minn) of the 3M Company. 任选的是，可在任何表面(如，墙壁或其他结构、或者标准显示屏)上观看生成的图像。 Optionally, the generated image can be viewed on any surface (e.g., a wall or other structure, or standard screen). 在优选实施例中，本文所述的投影透镜为紧凑型的。  In a preferred embodiment, the projection lens described herein is compact. 投影透镜的“紧凑性”可由多种物理特征来表征。 To characterize various physical characteristics of "compactness" projection lens may be. 在一个实施例中，描述了下述紧凑型投影透镜，其具有最大透镜直径相对焦距的比率（即Lmax/F)。 In one embodiment, it is described that a compact projection lens having a focal length ratio of the maximum relative to the diameter of the lens (i.e., Lmax / F). 最大透镜直径为具有最大直径的透镜元件的直径。 Maximum lens diameter is the diameter of the lens element having the largest diameter. 最靠近屏幕侧的透镜通常为具有最大透镜直径的透镜元件。 Lens closest to the screen side of the lens element having generally the largest lens diameter. 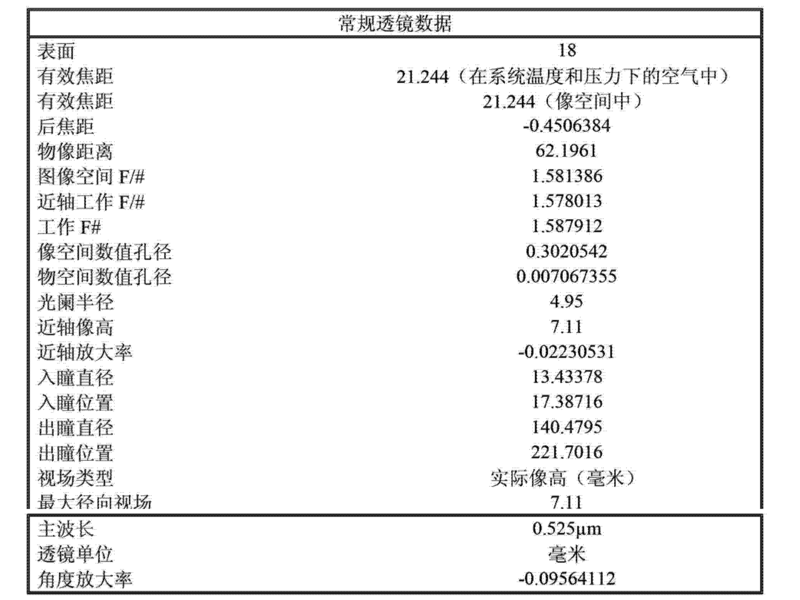 随着此比率的降低，透镜组总体的直径也降低。 With the reduction of this ratio, the overall diameter of the lens group is reduced. 本文所述的紧凑型投影透镜通常具有不大于1.5的最大透镜直径相对焦距的比率(Lfflax/F)。 Herein compact projection lens typically has a maximum lens diameter to focal length no greater than 1.5 of the ratio (Lfflax / F). 在一些实施例中，最大透镜直径相对焦距的比率不大于1.0。 In some embodiments, the maximum lens diameter to focal length ratio of no greater than 1.0. Lmax/F的最小值通常为至少0.7。 Minimum value Lmax / F is generally at least 0.7. 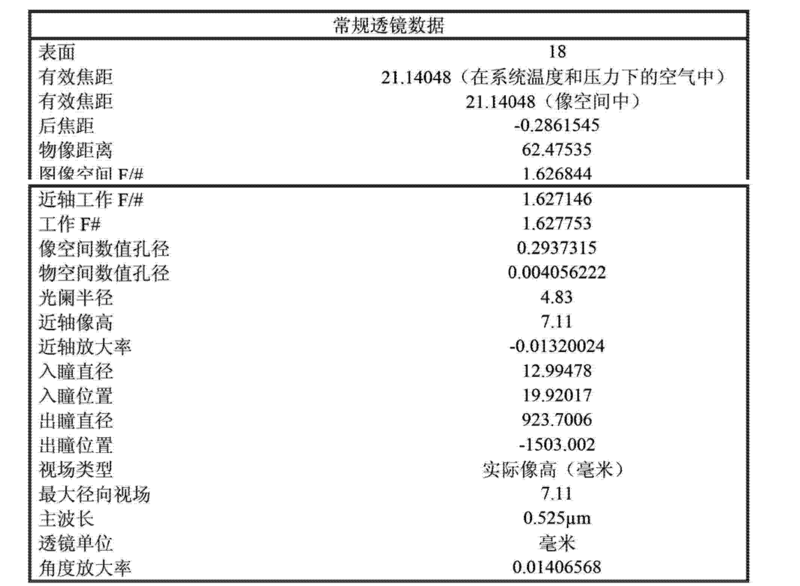 在一些实施例中，Lmax/F为至少0.85或0.90。 In some embodiments, Lmax / F is at least 0.85 or 0.90. 3.5、或不大于3.0。 3.5, or not more than 3.0. 总轨迹相对焦距的最小比率通常为至少2.50。 The minimum total track to focal length ratio is typically at least 2.50. 在一些实施例中，总轨迹相对焦距的比率为至少2.90、或2.91、或2.92。 In some embodiments, the total track to focal length ratio is at least 2.90, or 2.91, or 2.92. 在优选实施例中，本文所述的投影透镜具有由F#表征的高通过量。  In a preferred embodiment herein the projection lens having a high throughput characterized by the F #. F#通常为至少1.2、或1.3、或1.4。 F # is typically at least 1.2, or 1.3, or 1.4. 在一些实施例中，F3为至少1.50或1.55。 In some embodiments, F3 is at least 1.50 or 1.55. F#通常不大于2.4。 F # is usually not greater than 2.4. 在一些实施例中，F#不大于2.2、或2.0、或1.8。 In some embodiments, F # is not greater than 2.2, or 2.0, or 1.8. 本文所述的投影透镜具有至少20度且不大于50度的视场。  As used herein the projection lens having a field of view of at least 20 degrees and not more than 50 degrees. 在一些实施例中，视场为至少25、30、或35度。 In some embodiments, the field of view of at least 25, 30, or 35 degrees. 在一些实施例中，视场不大于40度、或41度、或42度。 In some embodiments, the field of view no greater than 40 degrees, or 41 degrees, or 42 degrees. 在其他实施例中，视场为至少40或45度。 In other embodiments, the field of view of at least 40 or 45 degrees. 本文所述的投影透镜具有高分辨率。  As used herein the projection lens having a high resolution. 分辨率是指投影透镜可分辨的图像的最小特征尺寸。 Resolution refers to the smallest resolvable feature size of the projection lens of the image. 可使用调制传递函数（MTF)来确定分辨率，所述调制传递函数（MTF)表示随空间频率变化的由透镜实现的从物体到图像的调制度的传递。 Using modulation transfer function (MTF) to determine the resolution, the modulation transfer function (MTF) represents the transfer from the object to the modulation of the image by the lens is achieved with spatial frequency. 可按照Optical System Design(Robert E.Fischer, Biljana Tadic-Galeb, Paul R.Roder;McGraw Hill, New York(2008),第191-198页）中所述来计算MTF。 Accordance Optical System Design (Robert E.Fischer, Biljana Tadic-Galeb, Paul R.Roder; McGraw Hill, New York (2008), pp. 191-198) in the calculated MTF. 分辨率被定义为交替的(黑色）线条和（白色）空白的最小宽度，其中全视场下的MTF大于或等于0.30。 Resolution is defined as alternating (black) and line (white) is the minimum width of the blank, wherein the MTF at full field of view is greater than or equal to 0.30. 在一些实施例中，分辨率为10微米、或9微米、或8微米、7微米。 In some embodiments, a resolution of 10 [mu] m, or 9 [mu] m, or 8 microns, 7 microns. 在其他实施例中，分辨率为6微米、或5微米、或4微米。 In other embodiments, a resolution of 6 microns, or 5 microns, or 4 microns. 在优选实施例中，描述了具有高通过量的紧凑型投影透镜。  In a preferred embodiment, there is described a compact projection lens having a high throughput. 具有这些特征组合的投影透镜的一个示例性实施例示于图2中。 An exemplary embodiment of a projection lens having these combinations of features shown in FIG. 屏幕的一侧。 Side of the screen. 在其他实施例中，F/F为负值。 In other embodiments, F / F is negative. 例如，F1ZiF可不大于-10、或不大于-20、或不大于-30、或不大于-40、或不大于-50、或不大于-60、或不大于-70。 For example, F1ZiF not greater than -10, or no greater than -20, or no greater than -30, or no greater than -40, or no greater than -50, or no greater than -60, or no greater than -70. 孔径光阑位于第二透镜组内或者第一和第二透镜组之间。  The aperture stop is located between the first and the second lens group or the second lens group. 第二透镜组（G2)由通常利用常规粘合剂粘结在一起的三个透镜元件(包括（L3)到（L5))形成。  The second lens group (G2) of three lens elements typically utilize a conventional adhesive bonded together (including (L3) to (L5 of)) is formed. G2具有正屈光力。 G2 has a positive refractive power. G2中的F2/F比率使得0.5〈F2/F〈2。 F2 / F ratio of G2 is such that 0.5 <F2 / F <2. 在一些实施例中，F2/F不大于1.5或1.2。 In some embodiments, F2 / F is not greater than 1.5 or 1.2. 在一些实施例中，F2/F小于1.0、或小于0.95。 In some embodiments, F2 / F is less than 1.0, or less than 0.95. 例如，F2/F可为至少0.70 或0.75。 For example, F2 / F can be at least 0.70 or 0.75. 第三透镜组（G3)由包括（L3)到（L6)在内的四个透镜元件形成。  The third lens group (G3) is formed by comprising (L3) to (L6 of) including four lens elements. G3具有正屈光力。 G3 has a positive refractive power. F3/F比率使得1〈F3/F〈8。 F3 / F ratio such that 1 <F3 / F <8. 在一些实施例中，F3/F不大于7、或6、或5、或4。 In some embodiments, F3 / F is not greater than 7, or 6, or 5, or 4. 在一些实施例中，F3/F为至少1.4、或1.6、或1.8、或2.0。 In some embodiments, F3 / F is at least 1.4, or 1.6, or 1.8, or 2.0. 如图2所示，透明固体(如玻璃)棱镜或偏振光分束器位于第二透镜组（G2)和第三透镜组（G3)之间。  As shown in FIG 2, a solid transparent (e.g. glass) prism or a polarization beam splitter positioned in the second lens group (G2) and the third lens group (G3) between. 在一些实施例中，棱镜不提供可测量数量的屈光力。 In some embodiments, the prism does not provide a measurable amount of refractive power. 在其他实施例中，棱镜具有有助于第四透镜组的屈光力的棱镜表面。 In other embodiments, the prism having a prism surface helps the refractive power of the fourth lens group. α2为二次项系数，04为四次项系数，α6为六次项系数，α8为八次项系数，α1(ι为十次项系数，α 12为十二次项系数，并且Ct14为十四次项系数。  α2 is the quadratic coefficient, 04 is a four coefficient, [alpha] 6 is the sixth coefficient, [alpha] 8 to eight coefficient, α1 (ι ten times coefficient, α 12 of twelve coefficient, and Ct14 fourteen times coefficient. 在一些实施例中，第二透镜组具有非球面表面。  In some embodiments, the second lens group has an aspherical surface. 作为另外一种选择或除此之外，第三透镜组可具有非球面表面。 Alternatively or in addition, the third lens group can have an aspherical surface. 为了便于制造，具有非球面表面的各个透镜通常由具有光学品质的热塑性或固化性聚合物材料形成。 For ease of manufacture, each lens having an aspherical surface generally formed from a thermoplastic or a curable polymer material having optical quality. 在一些实施例中，第一透镜组通常不含具有非球面表面的透镜元件。 In some embodiments, the first lens group having lens elements typically contain an aspherical surface. 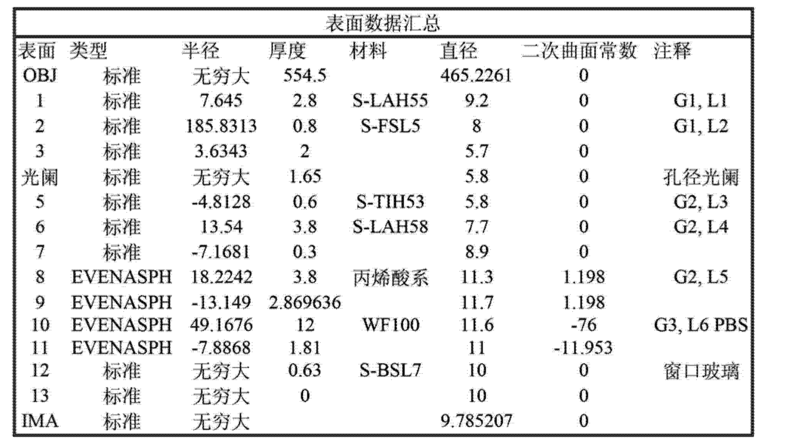 不含非球面表面的透镜可具有较低的制造成本。 Free aspherical surface lenses may have a lower manufacturing cost. 在其他实施例中，第一透镜组可具有非球面表面。 In other embodiments, the first lens group can have an aspherical surface. 当第一透镜组包括非球面表面时，透镜可具有较少的像差，然而具有较昂贵的制造成本。 When the first lens group comprises an aspherical surface, the aberration of the lens may have fewer, but with more expensive manufacturing cost. 不含非球面表面的透镜中的每一个均可任选地由热塑性或固化性聚合物材料形成，但通常由玻璃形成。 Lens free of an aspheric surface in each of which may optionally be formed from a thermoplastic or a curable polymer material, but is generally formed of glass. 光学品质透镜材料通常具有至少约1.50的折射率。 Optical quality lens materials typically have a refractive index of at least about 1.50. 第三透镜组在下文中进行详细的讨论。  The third lens groups are discussed in detail below. 第一透镜组（Gl)具有负或正屈光力。  The first lens group (of Gl) having negative or positive refractive power. 第一透镜组由多个透镜元件（即至少两个透镜元件）形成。 The first lens group is formed of a plurality of lens elements (i.e., at least two lens elements). 第一透镜组通常包括具有正屈光力的第一透镜元件和具有负屈光力的第二透镜元件。 The first lens group generally comprises a first lens element and the second lens element having a negative refractive power having a positive refractive power. 在第一透镜组中，最靠近屏幕的第一透镜元件（LI)通常具有(如三个）透镜组中所有透镜的最大直径。 In the first lens group, the first lens element (LI) closest to the screen typically have (e.g., three) of the maximum diameter of all the lens groups of the lens. 第一透镜组中的第一透镜元件具有足够大的直径，由此可在基本上没有畸变的情况下沿着屏幕方向以大于至少20°并且通常不大于50°的视角来投影图像。 A first lens group of the first lens element has a sufficiently large diameter, whereby substantially no distortion in the case where the screen along the direction of greater than at least 20 ° and the viewing angle is generally not greater than 50 ° to the projected image. 第一透镜组的第一透镜元件通常具有不大于50mm、或40mm的直径。 A first lens element of the first lens group generally has a diameter no greater than 50mm, 40mm or the. 第一透镜组的第一透镜元件优选具有不大于35mm或30mm的直径。 A first lens element of the first lens group preferably has a diameter of no greater than 35mm or 30mm. 第一透镜组的第一透镜元件的最小直径通常为至少8mm、或9mm、或10mm、或11mm、或12mm、或13mm、或14mm、或15mm。 The minimum diameter of the first lens element of the first lens group is typically 9mm 10mm 11mm 12mm 13mm 14mm 15mm at least 8mm, or, or, or, or, or, or, or. 第一透镜组（Gl)的全部透镜均可由玻璃构成并且具有球面表面。  All lenses of the first lens group (of Gl) is composed of glass and may have a spherical surface. 在一些实施例中，第一透镜组（GI)为粘结在一起的双透镜，以有助于控制球面像差和彗差。 In some embodiments, a two-lens of the first lens group (GI) is bonded together to help control spherical aberration and coma. 第二透镜组（G2)具有正屈光力。  The second lens group (G2) having positive refractive power. 第二透镜组可由多个(如四个）透镜元件形成。 The second lens group may be a plurality (e.g., four) lens elements are formed. 投影透镜的孔径光阑位于第二透明组内或者第一和第二透镜组之间。 The aperture stop is located between the projection lens group or the first and second transparent second lens group. 在一些示例性实施例中，如图2所示，第二透镜组包括具有正透镜元件（L3)和负透镜元件（L4)的双透镜以及具有正屈光力的两个单透镜（L5和L6)。 In some exemplary embodiments, shown in Figure 2, the second lens group comprises a double lens having a positive lens element (L3) and a negative lens element (L4), and two single lenses (L5 and L6) having positive refractive power, . 第三透镜组（G3)具有正屈光力。  The third lens group (G3) having a positive refractive power. 第三透镜组可由单个透镜元件（L7)形成，如图2所示。 The third lens group by a single lens element (L7 of) is formed, as shown in FIG. 任选的(如玻璃）棱镜或偏振光分束器设置在第三透镜组和成像器之间，即设置在距屏幕侧最远的位置处。  Optionally (e.g. glass) prism or a polarization beam splitter disposed between the third lens group and the imaging device, i.e., disposed at a position farthest away from the screen side. 可调节透镜之间的间距以平衡像差。  The spacing between the lenses can be adjusted to balance the aberrations. 以下的表1-3列出了图2的第一实施例的常规透镜数据、表面数据汇总、和非球面系数。  The following Table 1-3 shows the first embodiment of the conventional lens data in FIG. 2, data collection surface, and the aspherical coefficients. 以下的表2列出了从屏幕侧开始依次编号的表面编号(其中表面I为最靠近第一透镜元件LI屏幕侧的表面)、每个表面的光学轴线附近的半径（r)(毫米)、表面之间的轴向间距⑶（毫米)，并且还列出了材料类型。 Table 2 below lists the order from the screen side, the surface number (where I is the surface closest to the screen side of the first surface of the LI element lens) number, the radius (R & lt) (mm) close to the optical axis of each surface, ⑶ axial spacing between the surfaces (mm), and are also listed material types. 可通过公式曲率（C)=I/半径来计算曲率。 The curvature can be calculated by the formula (C) = I / radius of curvature. 本领域的技术人员将会认识到，从材料类型可以确定材料的折射率和色散系数。 Those skilled in the art will recognize that the refractive index and Abbe number can be determined from the type of material the material. 表面O为物体表面或投影屏幕的表面。 O surface is the object surface or the surface of the projection screen. 在此第一实施例中，投影透镜具有21.2mm的有效总体焦距、沿屏幕侧的方向具有37.2°的视场角，并且在F/1.59下工作。  In this first embodiment, the projection lens has an effective overall focal length of 21.2mm, having a field angle of 37.2 ° in the direction of screen side and operates at F / under 1.59. 投影透镜具有62.2mm的总轨迹。 The projection lens has a total track of 62.2mm. 因此，Lmax/F=0.960 并且TT/F=2.928。 Thus, Lmax / F = 0.960 and TT / F = 2.928. F1ZF=IS.68，F2/F=0.789，并且F3/F=2.096。  F1ZF = IS.68, F2 / F = 0.789, and F3 / F = 2.096. 对于此实施例利用70线对（Ip)/mm (7.0微米像素尺寸）的空间频率来生成MTF数据。  For this embodiment, data is generated using the spatial frequency of MTF 70 pairs (Ip) / mm (7.0 micron pixel size). 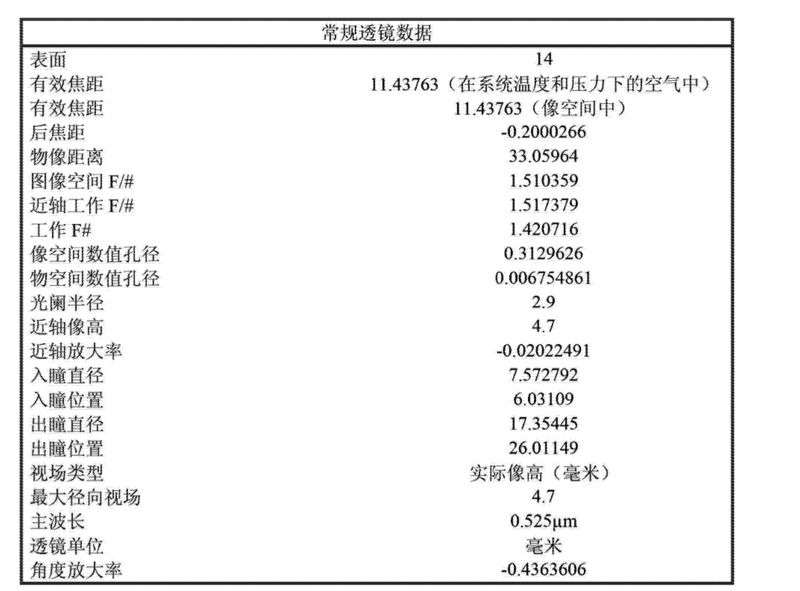 切向和弧矢MTF位于下表中。 Tangential and sagittal MTF are in the table. 由于全部MTF值均大于或等于0.30，则分辨率为7.0微米。 As all MTF values ​​are equal to or greater than 0.30, the resolution is 7.0 m.
 以下的表4-6列出了图2的第二实施例的常规透镜数据、表面数据汇总、和非球面系数。  The following Table 4-6 shows the second embodiment of the conventional lens data in FIG. 2, data collection surface, and the aspherical coefficients. 在此第二实施例中，投影透镜具有21.1mm的有效总体焦距、沿屏幕侧的方向具有37.4°的视场角，并且在F/1.63下工作。  In this second embodiment, the projection lens has an effective overall focal length of 21.1mm, having a field angle of 37.4 ° in the direction of screen side and operates at F / under 1.63. 投影透镜具有62.5mm的总轨迹。 The projection lens has a total track of 62.5mm. 因此，Lmax/F=0.965 并且TT/F=2.955。 Thus, Lmax / F = 0.965 and TT / F = 2.955. 第一透镜组Gl具有-1331.575mm的有效焦距；第二透镜组G2具有16.221mm的有效焦距；并且第三透镜组G3具有61.392mm的有效焦距。  The first lens group Gl has an effective focal length -1331.575mm; a second lens group G2 has an effective focal length 16.221mm; and the third lens group G3 has an effective focal length of 61.392mm. 因此，各个透镜组焦距相对于总体透镜有效焦距而言具有下述关系#/^=-62.988，F2/F=0.767，并且F3/F=2.904。 Thus, the focal length of each lens group with respect to the overall effective focal length of the lens having the following relationship # / ^ = - 62.988, F2 / F = 0.767, and F3 / F = 2.904. 对于此实施例利用81线对（Ip)/mm (6.2微米像素尺寸）的空间频率来生成MTF数据。  For this embodiment, data is generated using the spatial frequency of MTF 81 pairs (Ip) / mm (6.2 micron pixel size). 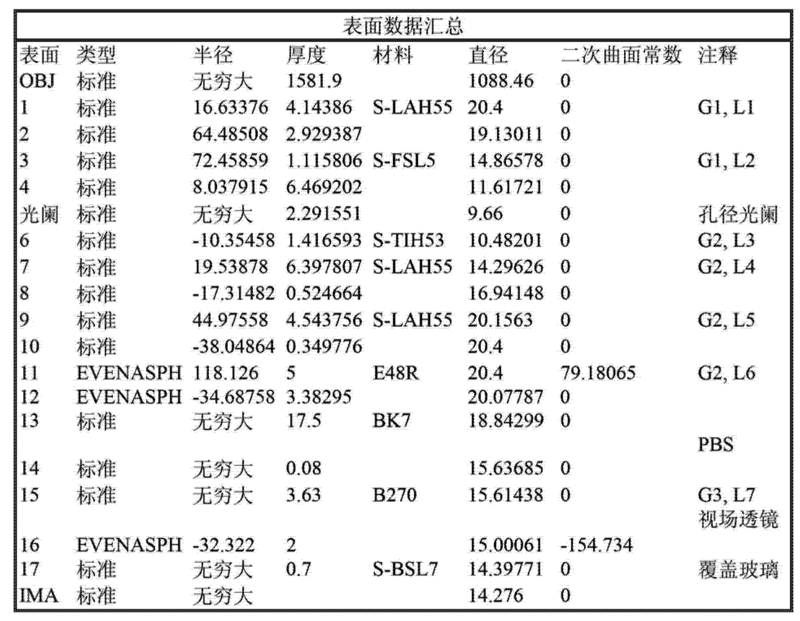 切向和弧矢MTF位于下表中。 Tangential and sagittal MTF are in the table. 由于全部MTF值均大于或等于0.30，则分辨率为6.2微米。 As all MTF values ​​are equal to or greater than 0.30, the resolution is 6.2 m.
 以下的表7-9列出了图2的第三实施例的常规透镜数据、表面数据汇总、和非球面系数。  The following Table 7-9 shows the embodiment of a conventional lens of the third embodiment of FIG. 2 data, surface data summary, and aspheric coefficients. 在此第三实施例中，投影透镜具有21.18mm的有效总体焦距、沿屏幕侧的方向具有37.1度的视场角，并且在F#/1.61下工作。  In this third embodiment, the projection lens has an effective overall focal length of 21.18mm, having a field angle of 37.1 degrees in the direction of screen side and operates at F # / under 1.61. 投影透镜具有62.15mm的总轨迹。 The projection lens has a total track of 62.15mm. 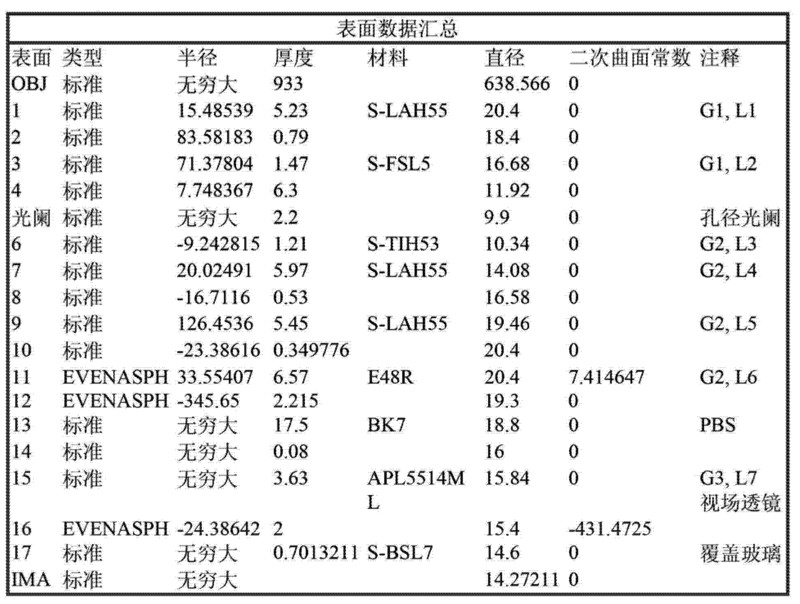 因此，Lmax/F=L 02 并且TT/F=2.936。 Thus, Lmax / F = L 02 and TT / F = 2.936. 第一透镜组Gl具有-989.24mm的有效焦距；第二透镜组G2具有17.423mm的有效焦距；并且第三透镜组G3具有45.257mm的有效焦距。  The first lens group Gl has an effective focal length -989.24mm; a second lens group G2 has an effective focal length 17.423mm; and the third lens group G3 has an effective focal length of 45.257mm. 因此，各个透镜组焦距相对于总体透镜有效焦距而言具有下述关系=F1/F=-46.72，F2/F=0.823，并且F3/F=2.138。  Thus, the focal length of each lens group with respect to the overall effective focal length of the lens having the following relation = F1 / F = -46.72, F2 / F = 0.823, and F3 / F = 2.138. 对于此实施例利用62线对（Ip)/mm (8.1微米像素尺寸）的空间频率来生成MTF数据。  For this embodiment, data is generated using the spatial frequency of MTF 62 pairs (Ip) / mm (8.1 micron pixel size). 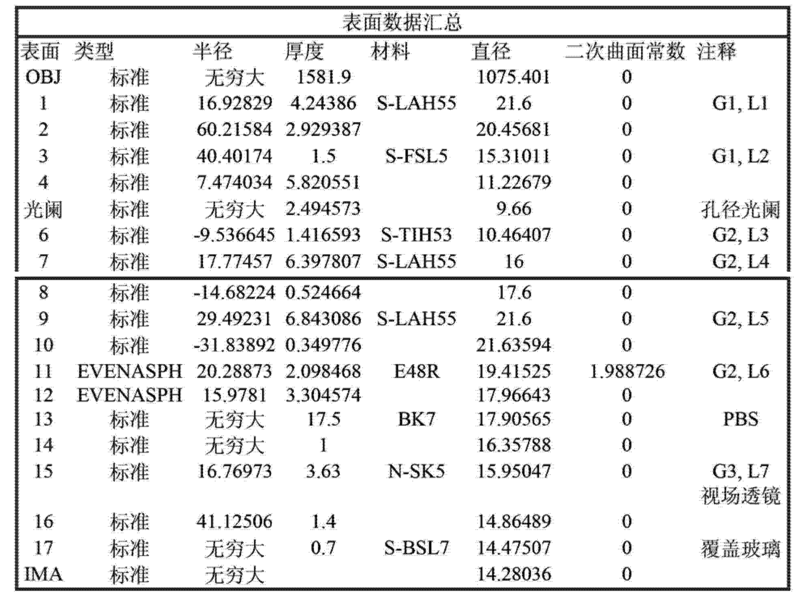 切向和弧矢MTF位于下表中。 Tangential and sagittal MTF are in the table. 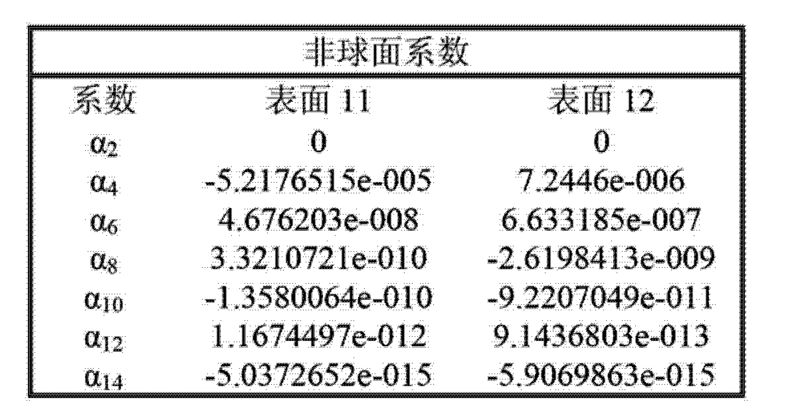 由于全部MTF值均大于或等于0.30，则分辨率为8.1微米。 As all MTF values ​​are equal to or greater than 0.30, the resolution is 8.1 m.
 以下的表10-12列出了比较例的常规透镜数据、表面数据汇总、和非球面系数。  The following table lists 10-12 Comparative Examples conventional lens data, surface data summary, and aspheric coefficients. 在此比较例中，投影透镜具有11.438mm的有效总体焦距、沿屏幕侧的方向具有45.0°的视场角，并且在F/1.42下工作。  In this comparative example, the projection lens has an effective overall focal length of 11.438mm, having a field angle of 45.0 ° in the direction of screen side and operates at F / 1.42. 投影透镜具有33.070mm的总轨迹。 The projection lens has a total track of 33.070mm. 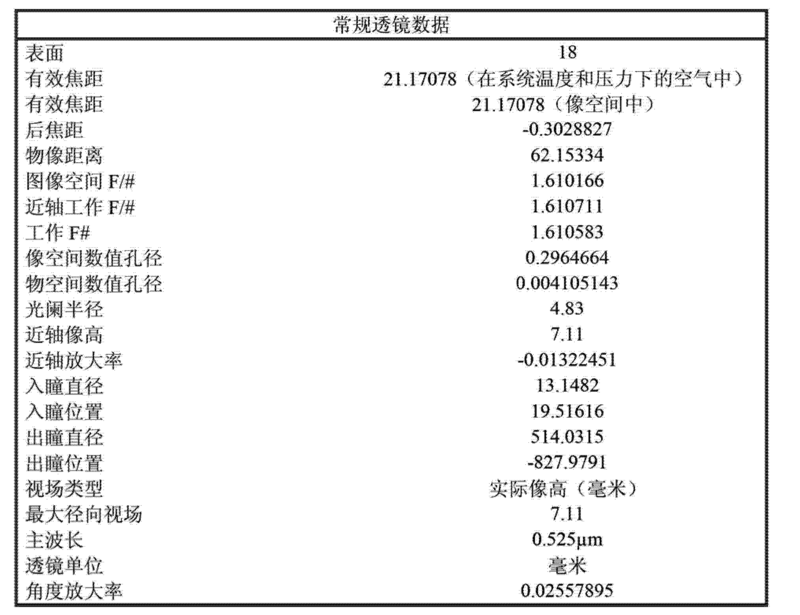 因此，Lmax/F=0.804 并且TT/F=2.891。 Thus, Lmax / F = 0.804 and TT / F = 2.891. 第一透镜组Gl具有239.443mm的有效焦距；第二透镜组G2具有11.472mm的有效焦距；以及第三透镜组G3具有14.596mm的有效焦距。  The first lens group Gl has an effective focal length of 239.443mm; a second lens group G2 has an effective focal length 11.472mm; and a third lens group G3 has an effective focal length of 14.596mm. 因此，各个透镜组焦距相对于总体透镜有效焦距而言具有下述关系#/^=20.93，F2/F=l.003,并且F3/F=l.276。 Thus, the focal length of each lens group with respect to the overall effective focal length of the lens having the following relationship # / ^ = 20.93, F2 / F = l.003, and F3 / F = l.276. [0101 ] 上述光学引擎可用于多种投影应用中。  The optical engine may be used for a variety of projection applications. 在示例性背投影应用中，图3A和3B分别示出了背投影显示装置100的侧视图和等轴视图。  In an exemplary rear projection application, Figs. 3A and 3B show a side view and isometric view of the rear projection display apparatus 100. 在示例性实施例中，显示装置100包括光学引擎110，所述光学引擎110类似于上述光学引擎61并且包括类似于上述投影光学器件66的投影透镜。 In an exemplary embodiment, the display apparatus 100 includes an optical engine 110, the optical engine 110 is similar to the optical engine 61 and the projection optics includes a projection similar to lens 66. 背投影显示装置100包括基座102、机箱104、和屏幕106。  rear projection display device 100 includes a base 102, a chassis 104, and a screen 106. 如图3A和3B所示，背投影显示装置可被实施为背投影电视。 3A and FIG, 3B rear projection display apparatus may be implemented as a rear projection TV. 其他具体实施例可包括可为一个或多个观看者提供大(如，40英寸对角线尺寸或更大尺寸）图像的商用和教育性显示装置。 Other specific embodiments may include providing for one or more large viewers (e.g., 40-inch or larger diagonal) image commercial and educational display devices. 基座102可容纳下述部件，例如光学引擎110以及电源、控制电子器件、音频部件、和连接器面板(为简洁起见未示出)，这些部件中的一个或多个可联接至光学引擎110。  below the base member 102 can receive, for example, an optical engine 110 and a power supply, control electronics, audio components, and a connector panel (not shown for brevity), these components may be coupled to one or more of The optical engine 110. 基座102也可被构造用于为显示装置100提供结构支承。 Base 102 may also be configured to provide structural support for the display device 100. 另外，根据光学引擎110的设计，基座还可包括反射表面(例如反射镜112)，所述反射表面可将图像从光学引擎110投影到屏幕106和/或容纳在机箱104中的另外的一个或多个反射表面，例如反射表面或反射镜114。 Further, according to the design of the optical engine 110, the base may further include a reflective surface (e.g., mirror 112), the reflective surface 110 may be an image projected from the optical engine and / or a further housed in the chassis 104 in screen 106 or more reflective surfaces, such as a reflective surface or mirror 114. 用于背投影显示装置100中的多个反射表面(或多个反射镜）112、114可被构造为（如）多个第一表面反射镜、反射型菲涅耳表面(或多个表面)、或另一种高反射性材料。 112, 114 may be configured (e.g.) a plurality of first surface mirrors, a reflective type Fresnel surface (or surfaces) a plurality of reflective surfaces (or mirrors) in the rear projection display apparatus 100 for , or another highly reflective material. 根据本文的具体实施方式，可将一个或多个反射表面与本文所述的光学引擎一起使用以将投影图像提供到屏幕106，这对本领域技术人员是显而易见的。 According to a particular embodiment herein, may be used in one or more reflective surfaces along the optical engine described herein to provide a projection image to the screen 106, it will be apparent to those skilled in the art. 机箱104可被构造为容纳一个或多个如上文所述的反射表面。  Chassis 104 may be configured to receive one or more reflective surfaces as described above. 此外，机箱104可支承显示屏106，所述显示屏106可被构造为提供一种或多种不同的图像格式，例如4 X 3格式、或16X9格式。 Further, the chassis 104 may be supported by a display screen 106, the display 106 may be configured to provide one or more different image formats, such as 4 X 3 format, or 16X9 format. 接收投影图像(参见(如）图3A所示的实例虚线）的屏幕106可根据投影的图像尺寸和格式而具有不同的尺寸和形状。  receiving the projected image (see (e.g.) instance shown in phantom in FIG. 3A) of the screen 106 may have different sizes and shapes according to the image size and format of the projection. 就屏幕构造而言，例如，屏幕106可包括多层材料，例如，被构造为如美国专利N0.6，179，426中所述的多个菲涅耳元件。 In terms of configuration screen, e.g., screen 106 may include multiple layers of material, for example, it is configured as a plurality of Fresnel elements as described in U.S. Patent No. N0.6,179,426. 屏幕可被设计为控制光强分布沿水平方向播散，以适应水平就位在屏幕前面的观看者。 Screen may be designed to control the light intensity distribution of the spread in the horizontal direction to accommodate viewers horizontal position in front of the screen. 屏幕的替代实施例可包括多层膜工艺、双倍增亮膜（DBEF)工艺、或VIKUITI™工艺，这些工艺均得自明尼苏达州圣保罗(Saint Paul, Minn)的3M 公司。 Alternative embodiments may include a screen multi-layer film technology, Dual Brightness Enhancement Film (the DBEF) technology, or VIKUITI ™ process, such processes are available from St. Paul, Minnesota (Saint Paul, Minn) of the 3M Company. 如上文所述，光学引擎110可按照与上文参照图1所述的光学引擎61相类似的方式进行构造并且可包括类似于上述投影光学器件66的投影透镜。  As described above, the optical engine 110 in accordance with the optical engine 61 described above with reference to FIG. 1 a similar manner and may include a configuration similar to the above-described projection lens 66 of the projection optics. 另外，光学引擎110可包括与上文所述相类似的照明系统和成像系统，并且可在结构上被构造为适应不同的基座和机箱设计。 Further, the optical engine 110 may include a similar imaging system and the illumination system described above, and can be structurally configured to accommodate different base and cabinet designs. 例如，光学引擎110可根据所使用的成像器或照明系统的类型而具有V形样式布局、U形样式布局、或L形样式布局。  For example, optical engine 110 may have a V-shaped pattern layout, U-shaped pattern layout, or an L-shaped pattern layout according to the type of imager or illumination system is used. 对于其中光学引擎110可以至少45或55度的视场角提供图像的实施例而言，机箱104的深度（X)相比于常规背投影显示装置可得以减小。 For embodiments in which the field angle of the optical engine 110 may be at least 45 or 55 degrees to provide an image, the depth of the chassis 104 (X) compared to conventional rear projection display device can be reduced. 例如，机箱104的深度（X)可为约5英寸至约15英寸、优选约7英寸至约12英寸、并且更优选约7英寸至约10英寸。 For example, the depth of the chassis 104 (X) may be from about 5 inches to about 15 inches, preferably from about 7 inches to about 12 inches, and more preferably from about 7 inches to about 10 inches. 根据本文的具体实施方式将理解的是，机箱104的深度（X)可根据诸如屏幕对角尺寸和图像格式之类的因素而有所改变。 According to a specific embodiment herein it will be appreciated that the depth of the chassis 104 (X) may be factors such as screen diagonal size and image format may vary depending upon the like. 在示例性实施例中，光学引擎110可包括采用（如)DLP、IXD、或LCOS技术的成像器或成像装置。  In an exemplary embodiment, the optical engine 110 may include the use of (e.g.) DLP, IXD, an imager or imaging device, or LCOS technology. 在一个示例性实施例中，光学引擎可提供具有4X3格式的图像。 In one exemplary embodiment, the optical engine can provide an image having a 4X3 format. 在另一个示例性实施例中，光学引擎可与合适的成像器一起实施，以提供不同的屏幕格式，例如16X9格式。 In another exemplary embodiment, the optical engine can be implemented in conjunction with a suitable imager to provide a different screen format, e.g. 16X9 format. 在其他示例性实施例中，可按照类似于上文所述的方式，利用（例如）灯组件(例如弧光灯或其他类型的灯)来构造照明系统。 In other exemplary embodiments, in accordance with a manner similar to the above using (e.g.) a lamp assembly (e.g. an arc lamp or other type of lamp) to construct an illumination system. 作为另外一种选择，光学引擎110的照明系统可采用固态系统，例如基于激光或基于LED的系统。 Alternatively, the illumination system of optical engine 110 may employ solid state systems, such as laser-based or LED-based system. 作为另外一种选择，光学引擎可与校正电路(如传统的图像扭曲芯片（Warpchip)) 一起实施，可以在甚至更短的投射距离生成足够的图像质量。  Alternatively, the optical engine can be implemented with correction circuitry (e.g., a conventional image warping chip (Warpchip)), may be generated in sufficient image quality even shorter throw distances. 此外，光学引擎被设计为使得需要少量或不需要梯形畸变校正，同时降低了畸变。  In addition, the optical engine is designed so requires little or no keystone correction, while reducing distortion. 例如，投影图像的畸变值可小于或等于2%，优选地小于或等于1.0%，更优选地小于或等于1.5%，并且甚至更优选地小于或等于0.5% (例如，其中畸变（d)可以由:d=(Hh)/h*100确定，其中h为近轴像高并且H为实际像高)。 For example, the distortion value of the projected image may be less than or equal to 2%, preferably less than or equal to 1.0%, more preferably less than or equal to 1.5%, and even more preferably less than or equal to 0.5% (e.g., where distortion (d) may determining d = (Hh) / h * 100, where h is the paraxial image height and H is actual image height): a. 在可供选择的实施例中，背投影显示装置可被设计用于墙壁安装型或顶篷悬挂型实施方式，其中基座部分用于容纳光学引擎和其他电子器件并且不需要它作为基架来支承该装置。  In an alternative embodiment, the rear projection display device can be designed for wall or ceiling-mounted hanger type embodiment, wherein the base portion for receiving the optical engine and other electronics, and it does not require as the base frame to support the device. 本领域内的技术人员将意识到，本发明可以同多种不同的光学部件一起使用。  skilled in the art will appreciate that the present invention can be used with a variety of different optical components. 虽然本发明已结合示例性优选的实施例进行了描述，但是在不脱离本发明范围的前提下，本发明可以通过其他具体形式体现。 Although the present invention has been exemplary preferred embodiments have been described, without departing from the scope of the present invention, the present invention may be embodied in other specific forms. 因此，应当理解，本文所描述或图示的实施例仅是示例性的，并且不应理解为限制了本发明的范围。 Thus, it should be understood that the embodiments described or illustrated herein are exemplary only and are not to be construed as limiting the scope of the invention. 根据本发明的范围，可以有其他变体和修改形式。 The scope of the present invention, there can be other variations and modifications. 1.一种投影透镜，包括从屏幕侧依次排列的下述部件: (a)第一透镜组； (b)具有正屈光力的第二透镜组； (c)具有正屈光力的第三透镜组； 并且至少一个透镜组具有非球面表面； 其中F为所述投影透镜的焦距； F1为所述第一透镜组的焦距； F2为所述第二透镜组的焦距； F3为所述第三透镜组的焦距； 所述焦距的比率如下: F1ZFI >5 ； 0.5〈F2/F〈0.9 ;并且1〈F3/F〈8。 A projection lens, comprising the following elements in order from the screen side: (a) a first lens group; (b) having a positive refractive power, a second lens group; (c) having a positive refractive power, a third lens group; and at least one lens group has an aspherical surface; wherein F is the focal length of the projection lens; Fl is a focal length of the first lens group; a focal length F2 of the second lens group; F3 of the third lens group focal length; the ratio of the focal length as follows: F1ZFI> 5; 0.5 <F2 / F <0.9; and 1 <F3 / F <8. 2.一种投影透镜，包括从屏幕侧依次排列的下述部件: (a)第一透镜组； (b)具有正屈光力的第二透镜组； (c)具有正屈光力的第三透镜组； 并且至少一个透镜组具有非球面表面； 其中F为所述投影透镜的焦距； F1为所述第一透镜组的焦距； F2为所述第二透镜组的焦距； F3为所述第三透镜组的焦距； 所述焦距的比率如下: F1ZFI >5 ； 0.5〈F2/F〈2.0 ;并且1.4〈F3/F〈8。 A projection lens, comprising the following elements in order from the screen side: (a) a first lens group; (b) having a positive refractive power, a second lens group; (c) having a positive refractive power, a third lens group; and at least one lens group has an aspherical surface; wherein F is the focal length of the projection lens; Fl is a focal length of the first lens group; a focal length F2 of the second lens group; F3 of the third lens group focal length; the ratio of the focal length as follows: F1ZFI> 5; 0.5 <F2 / F <2.0; and 1.4 <F3 / F <8. 3.根据权利要求1或2所述的投影透镜，其中孔径光阑位于所述第二透镜组内或者所述第一和第二透镜组之间。 The projection lens according to claim 1 or claim 2 wherein the aperture stop is positioned between said first or said second lens group and the second lens group. 4.根据权利要求1-3中任一项所述的投影透镜，其中所述视场角在所述屏幕侧的方向上为至少35°。 The projection lens according to any one of claims, wherein the viewing angle of at least 35 ° in the direction of screen side. 5.根据权利要求1-4中任一项所述的投影透镜，其中所述投影透镜具有不大于2.4的F#。 The projection lens according to any one of claims 1-4, wherein said projection lens having no more than 2.4 F #. 6.根据前述权利要求中任一项所述的投影透镜，其中所述投影透镜具有不大于5.5的总轨迹相对焦距的比率。 The projection lens according to any one of the preceding claims, wherein the projection lens has a total track of not greater than 5.5 to focal length ratio. 7.根据前述权利要求中任一项所述的投影透镜，其中所述投影透镜具有不大于3.5的总轨迹相对焦距的比率。 The projection lens according to any one of the preceding claims, wherein the projection lens has a total track ratio of no greater than 3.5 to focal length. 8.根据前述权利要求中任一项所述的投影透镜，其中所述投影透镜具有不大于1.5的最大直径相对焦距的比率。 The projection lens according to any one of the preceding claims in claim 1, wherein said projection lens has a maximum diameter no greater than 1.5 to focal length ratio. 9.根据前述权利要求中任一项所述的投影透镜，其中所述第一透镜组包括至少两个透镜兀件。 9. A projection lens according to claim any one of claims, wherein said first lens group comprises at least two lens elements Wu. 10.根据权利要求9所述的投影透镜，其中所述第一透镜组包括具有负屈光力的透镜元件和具有正屈光力的透镜元件。 10. The projection lens according to claim 9, wherein said first lens group includes a lens element having a negative refractive power and a lens element having a positive refractive power. 11.根据前述权利要求中任一项所述的投影透镜，其中所述透镜具有不大于1.8的F#。 11. A projection lens according to claim any one of claims, wherein said lens has no greater than 1.8 F #. 12.根据前述权利要求中任一项所述的投影透镜，其中所述第二透镜组、第三透镜组、或它们的组合包括非球面表面。 12. The projection lens according to any one of the preceding claims, wherein the second lens group, the third lens group, or a combination thereof includes an aspherical surface. 13.根据前述权利要求中任一项所述的投影透镜，其中所述透镜还包括位于所述第二和第三透镜组之间的偏振光分束器。 13. The projection lens as claimed in any one of the preceding claims, wherein said lens further comprises a polarization beam splitter positioned between the second and the third lens group. 14.根据权利要求1-13中任一项所述的投影透镜，其中所述透镜还包括位于所述第二和第三透镜组之间的棱镜。 The projection lens according to claim any one of claims 1-13, wherein the lens further comprises a prism positioned between the second and third lens groups. 15.根据权利要求14所述的投影透镜，其中所述棱镜包括有助于所述第三透镜组的屈光力的透镜表面。 15. The projection lens according to claim 14, wherein said prism comprises a refractive power of the lens surface helps the third lens group. 16.根据前述权利要求中任一项所述的投影透镜，其中所述透镜具有6微米的分辨率。 16. The projection lens as claimed in any one of the preceding claims, wherein said lens has a 6 micron resolution. 17.根据前述权利要求中任一项所述的投影透镜，其中所述第一和第二透镜组的组合具有所述总光强度的至少50%。 17. A projection lens according to any one of the preceding claims, wherein the first composition and the second lens group has at least 50% of the total light intensity. 18.一种光学引擎，包括: (a)照明系统； (b)成像系统；和(c)根据权利要求1-17所述的投影透镜。 18. An optical engine, comprising: (a) an illumination system; (b) an imaging system; and (c) a projection lens according to claim 1-17. 19.一种前投影显示装置，包括根据权利要求18所述的光学引擎。 19. A front projection display device, comprising an optical engine according to claim 18. 20.一种背投影显示装置，包括根据权利要求18所述的光学引擎。 20. A rear projection display apparatus comprising an optical engine according to claim 18.